By	Allyson Haymaker. Last edited by Marios Alexandrou on February 8, 2019. Judging from outward appearances, you'd never guess there's anything unusual about the ordinary-looking Paper House located in Rockport, Massachusetts. But it's odd, all right–the two-room house and its furnishings were created with approximately 100,000 newspapers from all over the world! We discovered the unusual attraction while traveling through Massachusetts. As we learned, Elis Stenman, a mechanical engineer who designed the first paper clip-making machine, started building it in 1922. Mr. Stenman used wood to build the framework of his summer home. But he made the exterior walls out of 215 layers of newspaper that are about an inch thick, believing newspaper would make good insulation. The walls are heavily varnished for waterproofing, and as a result, you can still read most of the newspapers. You could spend hours here perusing the stories on the inside and outside walls. It's like reading a historic account of the 1920s. Originally, Mr. Stenman had planned to cover the outside walls with clapboard. Being an ever-curious inventor, he wondered what would happen to the paper over the years, so he left it alone. It's still standing nearly 80 years later. 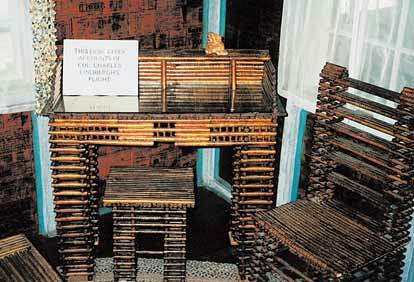 We were equally amazed by the furniture, which is also made of newspapers. To make it sturdy and waterproof, Mr. Stenman rolled up newspapers into tight cylinders and cut them to various lengths. So next time you're near Rockport, here's the scoop: The Paper House is truly an attraction worth visiting. Rockport is on historic Cape Ann along State Highway 127. To find the Paper House, follow Highway 127 to an area of town called Pigeon Cove. After you pass the Yankee Clipper Inn, take the second available left-hand turn, which is Curtis Street. Then take another left on Pigeon Hill Street; the Paper House is on the right at 52 Pigeon Hill St. The house is open daily from 10 a.m. to 5 p.m. from April 1 to October 31, but only on Saturday and Sunday the rest of the year. Donations are accepted. For details, call 1-978/546-2629.